The Refugee Question: Answered by Christian Mercy or the Sword of the State? 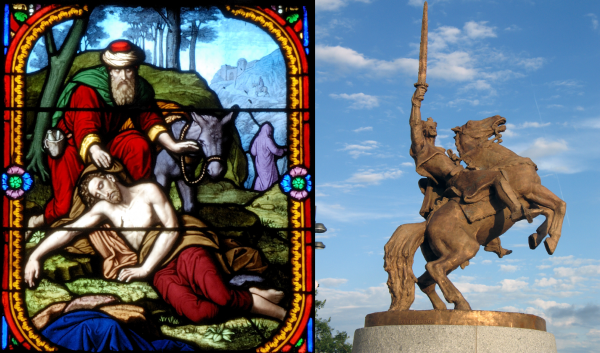 A stained-glass rendering of the Parable of the Good Samaritan and a statue of a sword-wielding king show the dichotomy between the responsibilites of Christians and the responsibilites of kings. Stained glass: Church of Saint-Eutrope in Clermont-Ferrand (Puy-de-Dôme, France). Statue: Ninth-century King Svatopluk I of Moravia. Ján Kulich, sculptor. Peter Zelizňák, photographer. There’s been an unfortunate mix-up. It’s happened because a lot of people, non-Christians as well as (very unfortunately) Christians, have not properly applied certain Scriptures that apply to two very different realms. In some of these Scriptures, Jesus Christ gives commands to His followers. Other Scriptures express God’s expectations for civil government. So, we have the followers of Jesus, and we have civil government. You might think it would be easy to keep these two distinct. But that’s not what’s happened. They keep getting confused.